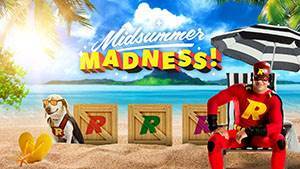 Insanity is in the air with the Rizk Midsummer Madness Casino promotion! Rizk is raising the stakes for the rest of the month of June offering the chance for players to win up to €100 every day. This promotion commences from noon on June 8th to midnight GMT on June 30th. The way it works is that you simply log into your account, where you will be presented with 3 boxes, each of which may contain up to €100 in prizes. You simply open a box every day to reveal your prize. Be part of the Midsummer Madness now! All new players to Rizk will enjoy a spectacular welcome bonus of 100% capped at €/£/$ 100, a maximum of 50 free spins and a spin at the Wheel of Rizk for additional prizes that include cash or free spins. Collect 50 free spins for a €50 deposit. Keep in mind that winnings from the Wheel of Rizk are exempt from wagering conditions and you get to keep them. Did you win free spins? Well, your subsequent winnings from these are wager free and this cash is credited to you. Bonuses vary by country and wagering for the bonus is 45x bonus. The full terms and conditions are also important and we recommend you read them.